Most of Kuala Lumpurโ€�s attractions like the Sultan Abdul Samad Building, Railway Station and Independence Square are conveniently found in the city center. Petronas Towers dominate the Kuala Lumpur skyline, with a sky bridge connecting the two towers at the 41st and 42nd floors where visitors can catch a bird's eye view of the surroundings. The observatory deck at the top of KL Tower also offers a panoramic view of the city. Pasar malam (night market) is an interesting facet of life in Kuala Lumpur. Test your bargaining skills at the night market at Petaling Street (Chinatown), with vendors shouting out their offers to vie for your attention. Splurge on designer brands in upmarket Starhill Plaza and Suria KLCC shopping mall or shop till you drop at the gigantic One Utama shopping center or Mid Valley Megamall. 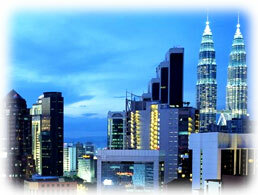 Book your hotel in Kuala Lumpur now for a fantastic shopping getaway. Swiss-Inn Kuala Lumpur is ideally located in the heart of Chinatown, Kuala Lumpur which is a bustling business, entertainment area and a shopping paradise. The hotel cititel Express strategically located on the fringe of the golden triangle of Kuala Lumpur City Centre, along Jalan Tuanku Abdul Rahman, this street was affectionately known as Batu Road, famed for its cobbled side streets of 'Little India'. The hotel Dynasty is within walking distance to the Putra World Trade Centre and near most major commercial buildings. The hotel Cititel Mid-Valley is located in the heart of Klang Valley, between Kuala Lumpur and Petaling Jaya, Cititel Mid Valley is the preferred address for business and leisure travellers. Crown Princess Hotel is located on the fringe of KL's golden triangle and is within the central business district, close to most major commercial buildings. It is also within 10 mininutes walk to the KLCC park. Corus Hotel Kuala Lumpur offers the best, from excellent entertainment, shopping, food and recreation. It is located within five minutes walk to the Kuala Lumpur City Centre.. The hotel Royale Bintang is located within a short walking distance to major shopping complexes including Berjaya Times Square, Bintang Walk, Starhill, Lot 10, the entertainment hub along the famous Jalan Bukit Bintang and the nearest LRT and Monorail stations. Hotel Nikko Kuala Lumpur is conveniently located along prestigious Jalan Ampang - the heart of KL's business, shopping and entertainment district. This 5 Star Deluxe Hotel is located in Kuala Lumpur's golden triangle nearby to the main shopping area, the world famous KLCC and KL Tower. In the heart of the main shopping and business district of Kuala Lumpur. Grand Millenium hotel is within easy walking distance of the many shopping centres, restaurants, banks and offices in the famous Golden Triangle.